Can superhero movies teach audiences about science? Dave Gibbons, author and artist of the Watchmen comic series, discusses the science behind the superheroes in his story. Physics professor James Kakalios talks about teaching science to the Watchmen actors and stuntmen. Are Critics Or Crowds Right About 'Watchmen'? Jeffrey Dean Morgan plays The Comedian, a character he believes is "a little bit on the insane side." 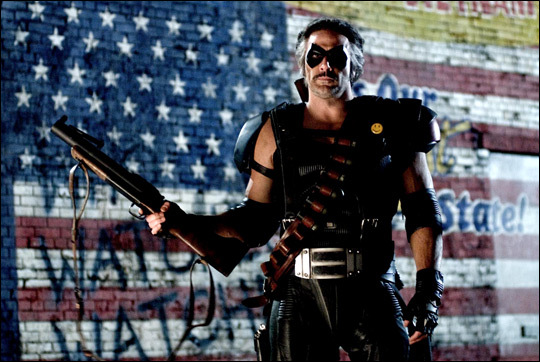 Watchmen topped the box office in its opening weekend, but critics across the country panned the film. Kenneth Turan, who reviews movies for both NPR and the Los Angeles Times, wrote "What went wrong with Watchmen is not really anyone's fault. It never should have been turned into a film in the first place. " And Anthony Lane, who reviewed Watchmen for the New Yorker, called the opening sequence "easily the highlight of the film." John Ridley has written both movies and comic books. He thinks there's "nothing wrong" with the film and that critics might just need to get over themselves.